This tutorial cover how to make dynamic dependent select box by using Ajax JQuery in Laravel framework. 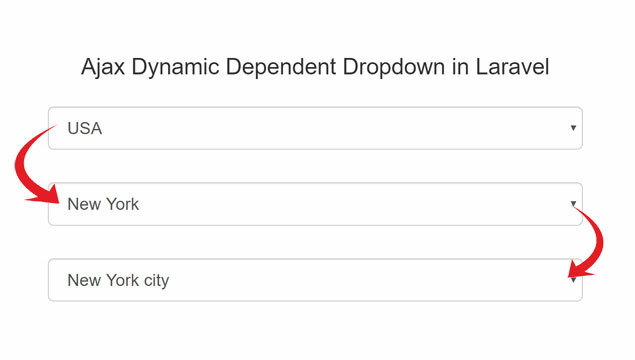 This is new post on Laravel with Ajax tutorial and in this we have developed simple Country State and City Dynamic Dependent dropdown list box in Laravel by using JQuery Ajax. Dynamic Dependent means child drop down list data has been filled when we have select parent drop down list box. e.g. In Country State City dynamic dependent select box example, when we have select particular country in select box then in state select box has been filled with state data of selected country and when we have select particular state in select box then city select box has been filled with list of city of selected state. This way this dynamic dependent dropdown list box has been working. Here we have use Ajax with Laravel for developed dynamic dependent select box. When we have select parent select box then it will send Ajax request to Laravel code for fetch data for child select box. So this way child select box has been filled with data. This whole process has been done without refresh of web page because we have use Ajax with Laravel. We have already publish this dynamic dependent select box tutorial by using PHP with Ajax but now we have publish in Laravel framework also. Because there are many programmers has been use Laravel framework for their web development. For this first we have to make one controller for handle HTTP request for this feature. For this we have to write following command in command prompt. This command will make DynamicDependent.php controller under app/HTTP/controllers folder. In this controller first we have to make index() method. This method will load view file with three dynamic select box like country, state and city. In which country select box has been filled with country data and state and city select box will be blank. Both drop down list box data has been filled when we have select country select box. This code will load dynamic_dependent.blade.php view file with three drop down list of Country, state and city. This code will filled country dropdown list box with data and other two select box will be blank. Below you can find source code of view file. In this code we have also write jquery code on select box change event. In country and state select box we have define .dynamic. We have use this class as selector in jquery code. When we have select any option then jquery code will be run and in that we have use Ajax request to fetch() method for send data to server. On server side it will fetch particular state or city data and send back to Ajax request. Based on value of data-dependent attribute in which we have store id of child select box. And based on that value particular state or city drop down list box has been filled. Lastly, We have to set route for index() and fetch() method of DynamicDepdendent.php Controller class. For this we have to go to routes/web.php file. This is complete source of Dependent Country State City Dropdown using Ajax JQuery in Laravel. For download complete source code with file, please download from by clicking on below link. hello sir thanks for your great tutorials, please can i have the database? ?